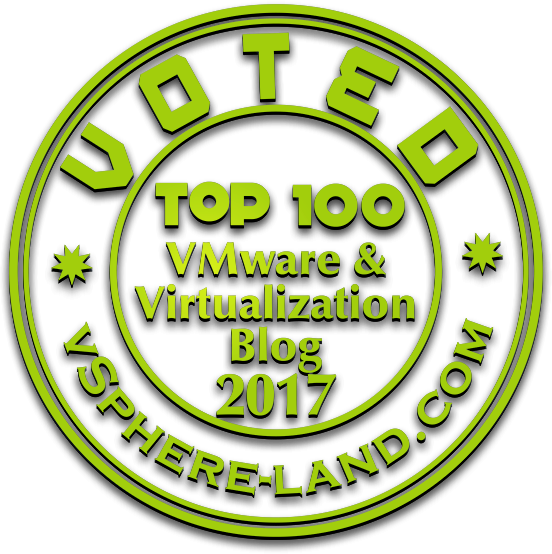 As every year Eric Siebert started the collection for votes regarding the best blogs within the virtualization field. Caused by the great blogging-landscape I was quite surprised last year to have reached the Top 100. To be honest this was surely related to my engagement during Partner enablement and Trainings (where one or the other blog post of mine has been shown). Since I have been trapped in Projects for the last months I would be really surprised to reach this position again. Anyway I felt very honoured to be qualified again as a #vExpert and for the first time also as an #EUCchampion. I tried to deliver content that is technically useful (from my hardly learned lessons) or gave you some insights in my thinking or conference experiences (VMworld videos). So if you took some fun or benefit out of my content I would really look forward to gain the one or another vote. Here you can give your vote. Thanks Turbonomic (formerly VMturbo) and Eric Siebert to sponsor and execute this event once again. So if you want to give me your vote, I would be really grateful. Anyway I definitely can recommend the following blogs since I spend a lot of time gaining knowledge or enjoyed the reading during the year with them. Running-System (A. Lesslhumer): Love his ESXTOP Poster… I tried to export this great piece of information within the whole world… -> no-one leaves my VMware class without knowing this poster. Besides that Andreas’ content is quite useful when you visit the classical IT conferences like VMworld/Veeam/etc. Virten.net (Florian Grehl) : A german fellow with passion for virtualization. His blog posts about vSAN (especially RVC) gave me a lot of useful information during projects and training development. Even though I don’t have a NUC it seems that Forian has created quite useful content here as well. vCloudnine (Patrick Terlisten): I follow (and still unfortunately never met him in real-life) for multiple years. I always enjoyed his posts about real-life configurations, problems and solutions. Keep on with your great job. vBrain.info (Manfred Hofer): Fred’s amount of posts decreased a lot with the creation and rise of his children (are that the right verbs?! :) (I see a correlation and causality). I would say that’s a good excuse. I still enjoy his activity on twitter and posts. Without him & Andreas awesome night during VMworld 2015 at the hard-rock cafe I would never come that deep into VMware blogging and into the community. A shame he will not attend this years VMworld in Barcelona. haveyoutriedreinstalling.com Féidhlim O’Leary: I really enjoyed his blog posts about the vCenter Server Appliance HA mechanism. Also he is one of the guys who is really really helpful when I shout out for help on Twitter. And of course the classical top blogger we don’t really need to talk about. The mentioned people and list are far away from being complete. So please be sorry if you don’t get mentioned right here :). I would need 4 hours more of writing to give everyone the credits he deserves.